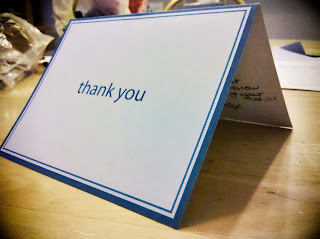 I wanted to share this very special thank you card that I received back in April. This letter is from a bride and groom who were married in mid April at the Rincon Beach Club in Carpinteria, Ca. We had photographed their engagement session in early November at Kuleto Winery in Napa, Ca. Although my husband and Alex work together with the US Forest Service, we were honored to have the pleasure to work for them and be their wedding photographers. As a photographer, I thoroughly enjoyed this amazing time that we got to work with Alex and Cody; from their engagement photo session and seeing the sheer bliss on the couple's faces, to designing their save-the-date cards, to designing their photo enlargement for the guest sign-in matte board for their wedding day, with our awesome meetings and dinners, to being with them on their rehearsal day, and being with them at every step of the way on their wedding day, to designing their thank you cards, making their slideshow of memories, and we recently just finished designing and ordering their amazing wedding album. We still have a little more work to do with their parent's wedding albums, which I look forward to making :) I really love what I do, and when I get a special note from a bride and groom, it awakens an even deeper feeling of joy for my job. Thank you so much for being our photographers! Your work is amazing, and we continue to receive compliments from all our family and friends. It has been a true pleasure working with you. We'd love to add a review to your website–let us know how to go about that.